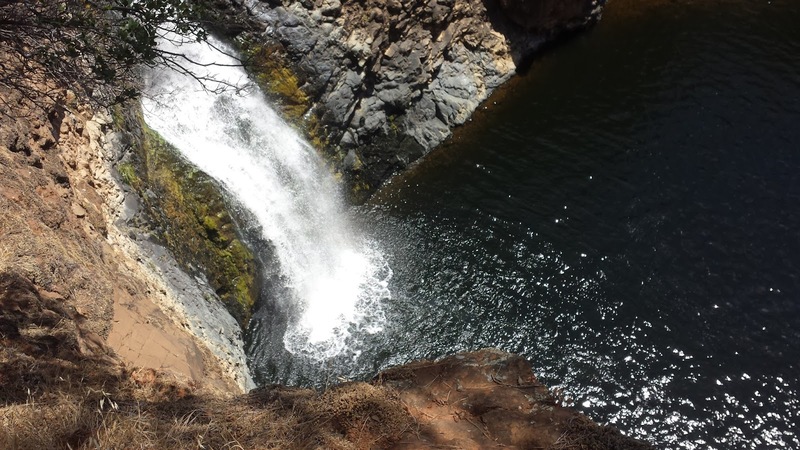 Beale Falls is a small waterfall located west of Beale Air Force Base that is popular hiking and swimming destination. A small creek called Dry Creek parallels most of the sloped trail as it winds up and down the foothills where it eventually reaches the falls. This was my first visit to the falls and where there is water there are fish. Time to explore some new local waters. 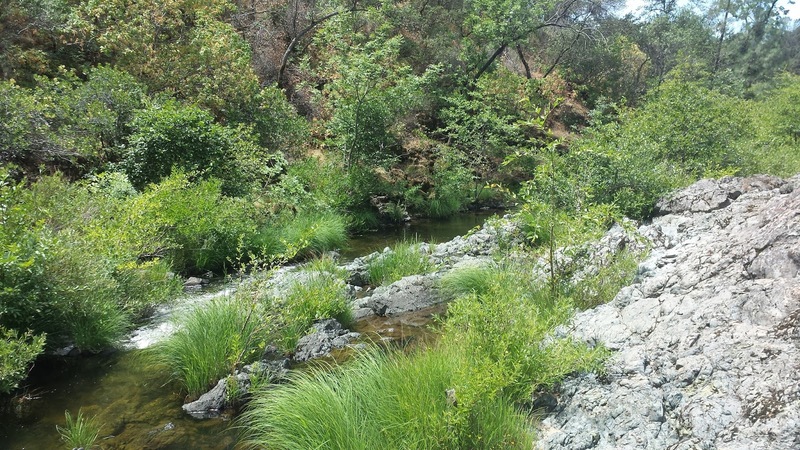 In the Yuba-Sutter area there are two small creeks that share the name Dry Creek. One stream runs below Collins Lake where it eventually meets with the Yuba River and the other runs below Beale Falls where it merges with the Bear River near Wheatland. We planned a day trip that was joined by my family who also wanted to go. After driving about thirty minutes through curved, sloped, dirt, and unpaved roads we eventually reached the Fairy Falls Trail/Beale Falls trailhead. The bridge that overlooked the creek looked promising. 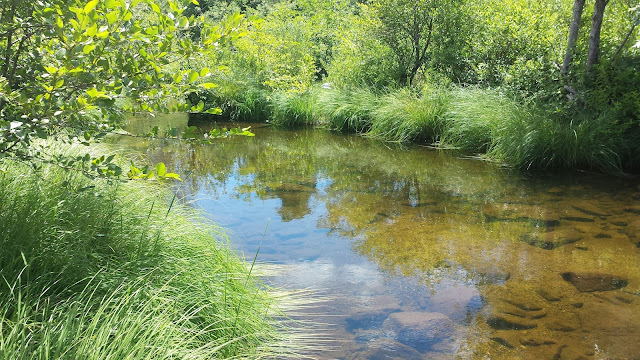 The creek was heavily overgrown along the banks and was refreshingly cool with tea-tinted water. This looked like a creek best suited for smallmouth and sunfish. My brother spotted the first fish as he leaned over the bridge. After a quick glanced, I identified the small swimming object as a bluegill. The next group of fish we spotted looked like bronzebacks aka smallmouth bass. "See I told you there were fish," remarked the missus. Well I'll be damned. About halfway into the hike we stopped and played in a small pool. The girls were busy catching bullfrog tadpoles as my brother and I shared my 3WT throwing flies at fish. The first fish of the day was a small pumpkinseed that took an olive woolly bugger. The bass in the pool were a bit finicky. 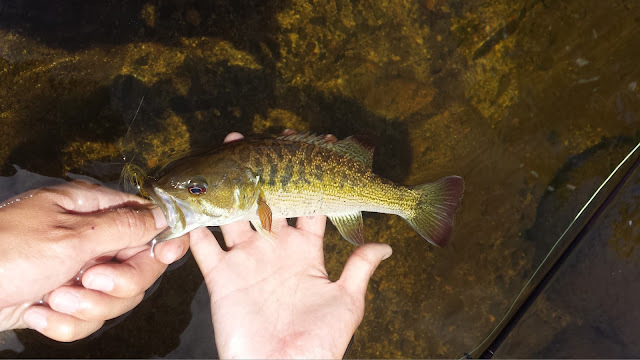 Hidden underneath a sunken log, the small school of bass would peek out from time to time to observe my fly and ignore it. I eventually tricked one into eating and viola a nice... smallmouth bass? The top coloration on this bass was similar to a smallmouth but it had a white belly and red fins. 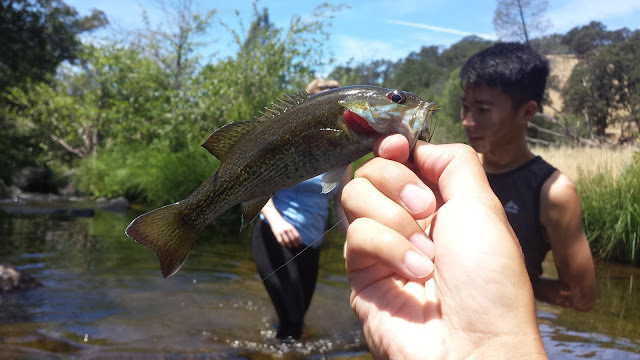 After comparing it with pictures of other species, I've concluded that the bass in Dry Creek are actually Redeye Bass. Pretty neat. 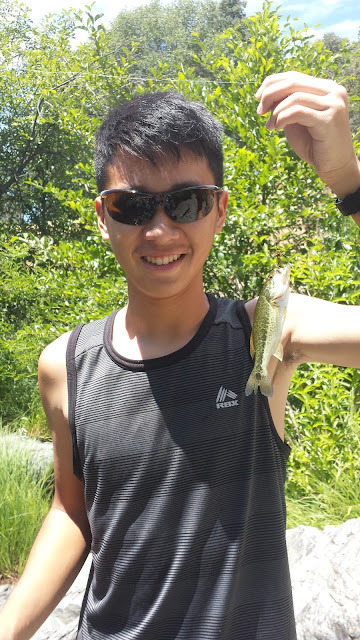 We stopped once more at a nice pool where Nick caught what looked like a largemouth bass. Looks like more than one species of bass inhabit these waters. The next time we visit I'm going to bring some buggers tied on a size 10 hook. These fish are way too small to be eating size 6 buggers. Eventually we found our way to the falls. Quite a fun hike. I would definitely do it again.